We are assembled in "Heavenly," it means that the position of the believer. That, if I'm prayed up, you're prayed up, or the church is prayed up, and we're ready for the Message, and we have assembled ourselves together as saints, called out, baptized with the Holy Ghost, filled with God's blessings, called, elected, set together in Heavenly places now, we are Heavenlies in our souls. Our spirits has brought us into a Heavenly atmosphere. Oh, brother! There you are, a Heavenly atmosphere! Oh, what could happen tonight, what could happen tonight if we would be sitting here in a Heavenly atmosphere, and the Holy Spirit moving over every heart that's been regenerated and become a new creature in Christ Jesus? All sins under the Blood, in perfect worship, with our hands up to God and our hearts lifted, setting in Heavenly places in Christ Jesus, worshipping together in the Heavenly places. Did you ever set in one? Oh, I have set till I would weep for joy and say, "God, never let me leave here." Just Heavenly places in Christ Jesus! 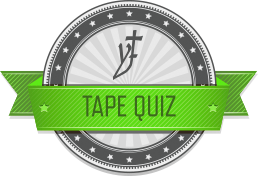 Anyone can take the Foundation tape quizzes, but only those between the ages of 2-28 who are logged in with their YF ID# will receive points and have their names posted on the quiz results page. In order to earn reward points, you MUST first listen to the message before submitting each quiz. All past quizzes can still be taken at any time, but you will only receive 50% of the points. _______ usually catches the sinner, brings him under condemnation by the Word. But _______ places a man positionally what he is. Which heavens did God let Brother Branham be caught up to see? Which two books of the Bible does Brother Branham teach on that perfectly parallel one another? Canaan represents the age of the Millennium. What is the land promised to the New Testament believer? Just as there were _____ stages in Israel's journey to the promised land, so is there in the believer's journey. God gave Joshua the promise to fight an entire campaign without losing a man, without even getting a scratch. What caused innocent men to die one day? In the book of Ephesians, who is Paul addressing? How do we get in Christ Jesus? When Israel crossed over into the land, they still ate of the manna. "As God was with _______, so is God (in the _______) moving us about." Who doesn't know who their papa and mama is? "Blessed be the God and Father of our Lord Jesus Christ, who has blessed us with _______ spiritual blessing..."
What means the "One Who exists with His family"? When were our names put in the Lamb's Book of Life? Election looks back to _______, and predestination looks to _______. What was in God that projected something out that He could save? God looked down out of the Heaven and said, "_______, you're a man after My Own heart." Jesus never said "Pray for them," He said, "Just lay their hands on them." If you have faith enough for salvation for yourself, can't you also have faith enough for your house? If you would like to participate in our online quiz and send your results to Young Foundations, please type in your full name and age below and click the "Check & Submit Answers" button. Only those between the ages of 2-28 who are logged in with their YF ID# will receive points and have their names posted on the quiz results page. I do NOT wish to have my results posted online. Here are the current quiz results for Adoption #1. Anyone taking the quiz after Friday, June 5, 2015 will not have their score posted. "And by seeing those Seals revealed, and the great things that’s taken place right here in the last few years, I believe with all my heart that the door of mercy is beginning to close, and You’re ready to take Your journey now to redeem Your people."